An inspirational journey through black fashion in America from the twentieth century to the present, featuring the most celebrated icons of Black style and taste. One of the few surveys of Black style and fashion ever published, How to Slay offers a lavishly illustrated overview of African American style through the twentieth century, focusing on the last thirty-five years. 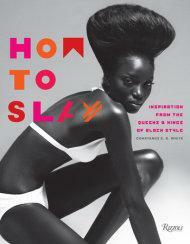 Through striking images of some of the most celebrated icons of Black style and taste, from Josephine Baker, Michelle Obama, Maya Angelou, and Miles Davis to Rihanna, Naomi Campbell, Kanye West, and Pharrell Williams, this book explores the cultural underpinnings of Black trends that have become so influential in mainstream popular culture and a bedrock of fashion vernacular today. A preponderance of Black musicians, who for decades have inspired trends and transformed global fashion, are featured and discussed, while a diverse array of topics are touched upon and examined?hats, hair, divas, the importance of attitude, the use of color, ?60s style, the influence of Africa and the Caribbean, and the beauty of black skin. About the Author Constance C. R. White is an award-winning journalist, a former editor in chief of Essence magazine, former New York Times style reporter, and the first black executive fashion editor at a major fashion magazine, at Elle. She conceived and edited the book Essence: A Salute to Michelle Obama (2013) and authored Stylenoir (1998). She currently is a contributor to TheImpression.com. Valerie Steele is director and chief curator of The Museum at the Fashion Institute of Technology where she has organized more than twenty exhibitions since 1997.